Luton boss Mick Harford expressed huge disappointment that his side weren't 'out of sight' in the first half of their 2-2 draw against Blackpool this afternoon. 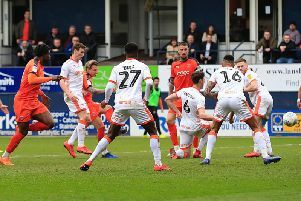 The Hatters started superbly during the opening 25 minutes at Kenilworth Road, moving in front through James Collins' 22nd of the season early on. It looked a definite case of how many Town would win by, before they were stung by Nya Kirby's equaliser on the half hour. After the break, Luton were reduced to 10 men with Collins dismissed after 61 minutes, Matty Virtue making it 2-1 just 60 seconds later. Sub Jason Cummings grabbed a late leveller for the Hatters who are now a club record 28 league games unbeaten, but when asked if he was satisfied with a point, Harford said: "I don't think so. "They came, they set themselves out to defend, they defended deep. "You've got to give them a little bit of credit in all fairness, the shape of their defensive unit was good, they got blocks in, the keeper made, not too many saves, but he looked adequate of the balls we put in the box. "In the first 20-25 minutes, the game should have been out of sight with the positions we got ourselves in, and the opportunities that we had. “We had numerous opportunities, shots were getting blocked, here, there and everywhere, and give them some credit, it was frustrating. These are the 15 areas with the highest reports of drugs crime in Luton - how does your area compare?